The Historical Society was founded in 1974 as a non-profit society to preserve the heritage of the people of Piermont. 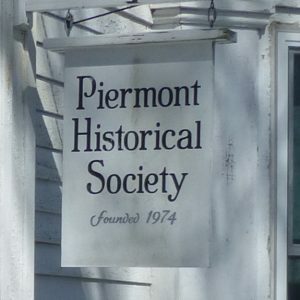 The Mission of the Historical Society is to collect, catalogue and preserve memorabilia, photographs and verifiable historical records of the people, events, and changes in the town lands that have shaped and colored the history of the Town of Piermont from its earliest days even before its incorporation into the State of New Hampshire through the present day. The Society houses the largest part of its collection in the upper rooms at the Town Library and maintains a room in the Old Church Building for special exhibits. In recent years, these exhibits have featured Lake Tarleton, the Piermont Village Schools and Piermont Farms.